This past year has been so exciting for me! I learned how to swim, how to play with my new best friend (Ginger), and how to take over a bed! Mom and Dad even bought a new King size bed so we can all fit in it at night. Now if I could just stop snoring in Dad's ear. I've explored parks that I never knew existed; I have made so many new friends on my daily walks throughout the neighborhood each day. I learned how to chew big knuckle bones, how to chase the ducks from our yard...they sure are quick! I went on my 1st boat ride which I enjoyed very much. Dad�s even taken me on a couple of runs though I seem to keep running into him�.something to work on. Best of all, I have learned what it means to be truly loved. I have been allowed to become the companion and friend I always knew I could be. I just needed the opportunity. All this in just over one year. Imagine what I'll learn and do over my lifetime with my family! I wish EVERY dog could be loved & cherished this much!!!! 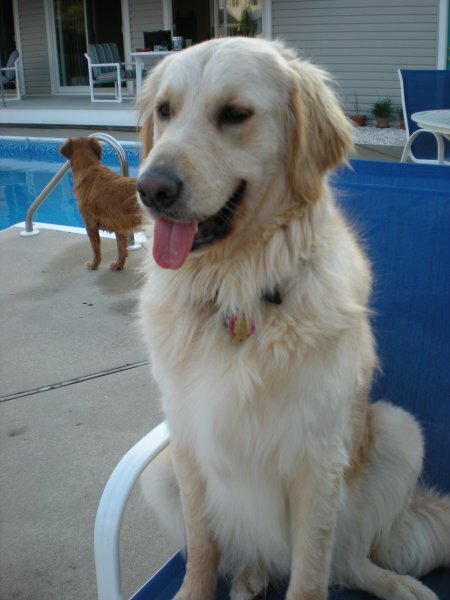 Oakley found his forever home with us on August 28, 2008 � he�s a big, beautiful, blond boy! 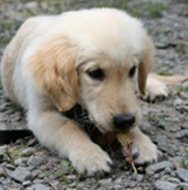 He was formerly known as �Bob,� but he reminded us of a blond surfer dude, so we decided to call him Oakley (like the sunglasses!). He found us when we needed him most. 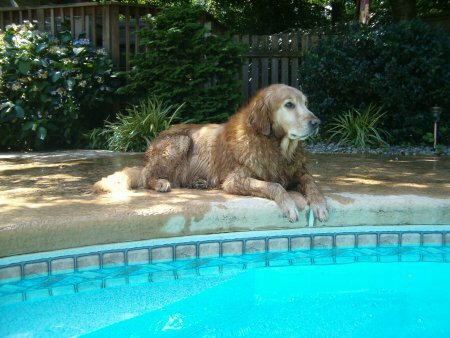 Brandy, one of our first Goldens, had passed away suddenly a month earlier. 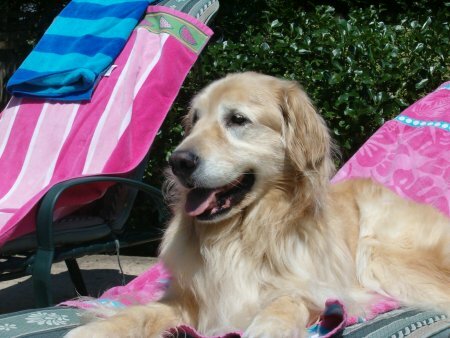 But Oakley turned our sadness to smiles and brought golden sunshine into our lives. He is an amazing snuggler and always a willing participant in a Sunday afternoon nap! One of the things we love most about him is his huge head, and we tell him he has a ginormous cranium! He is a goofy, lovable boy, and he never fails to make us laugh! 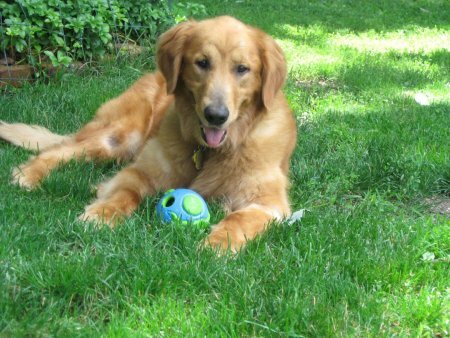 Very sadly, a month after Oakley came, Brandon, another one of our Goldens, passed away � we were devastated. But we waited very patiently for some special �old gold� to find us (we love the seniors! ), and we hit the jackpot when Quincy came home on February 11, 2009. We originally fostered him (foster?... no such thing � he wasn�t going anywhere!) until he could have surgery to remove a growth on his side, and we couldn�t wait to sign the final adoption papers a few weeks later! Affectionately nicknamed �Monkey Bear,� Quincy, like Oakley, has brought such joy to us. He loves to be petted and will put his head in your lap or persistently stick his nose under your hand � he just loves to be loved! Thank you GRRI-NJ for bringing these two wonderful boys into our lives! After majoring in Drama, this six year old beauty has landed the role of a lifetime. 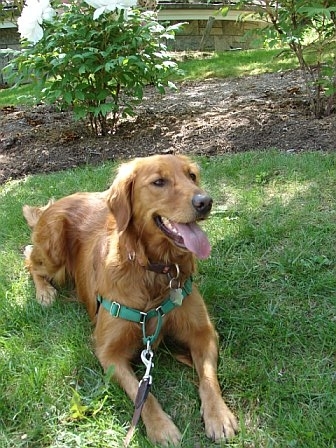 Annie, formally known as Annie, is now playing the starring role for an unlimited engagement. She has a broad fan base including children and adults. 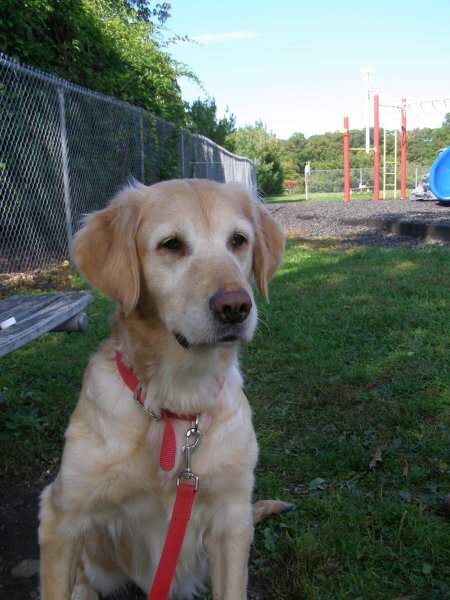 Annie makes regular appearances at tennis courts, soccer fields and football games. She has also been spotted hiking and taking an occasional swim at county parks. "Playing in the Yard" - she's a natural, two thumbs up! Annie would like to thank all the people that made her the success she is today. GRRI-NJ, thank you for your support; Anne and Rich M, for all your hard work and for caring so much. Thank you just doesn't seem to be enough. When we picked up Maverick (formerly known as Rusty) from Eileen and Drew who had pulled him from the shelter, Eileen said �you guys are in trouble now; if he gets along with the rest of your boys you�ll never give him up.� Needless to say, we�re �foster failures� once again! 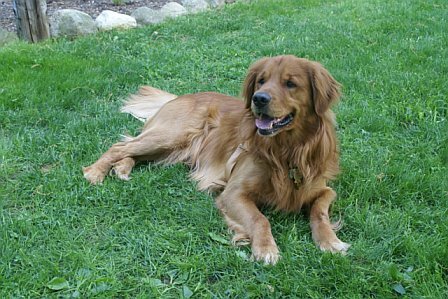 To read about Maverick�s ear problems go to our website to the Winter 2009 newsletter and see Rusty�s story. Maverick has been with us for 10 months now and he is really coming into his own. The first couple of months with his ear problems, he wasn�t interested in much but now give him a tenny and see what a 12-year -old can do. He loves his car rides even if it�s only to go for a ride in the rain. He loves his walks and his ears do a happy dance as he prances along. And he loves meeting new people. He went to his first Goldstock earlier this month and took to riding in the RV like he did it every day. He went in the lake and had a blast chasing the tennis balls in the water. Maverick conned quite a few people out of their tennis balls by giving them his A look. He worked the booth like a pro and didn�t meet a person or a golden that he didn�t like. He�s been an absolute joy. His nickname is the Hon Bun. My foster parents loved me so much they became �foster failures� within less than a week of having me! When I came to them, it was a rough transition as I was nearly 9 years old and my prior family had to give me up due to divorce, finances, etc. I was 15 pounds heavier and by the looks of some of my bare spots, history of my allergy problems was evident. But my new parents were bound and determined to trim me down. I have to say, I liked the walks but it was a big change from my old routine of sitting on the couch all day! I quickly adapted and between the walks and getting my thyroid corrected, I lost 15 pounds in a short time. If only we had such luck with my allergies � but we are working on those. My new family is like a second life; there seems to be endless tennis balls, camping trips, hiking trips, etc. They even took me and my brother Alpine to Philadelphia for a long weekend. And now that I am thinner, going to the park and long walks is fun versus a struggle. I hope I have many more years with them of licking their faces nonstop!! Parker � no longer and never again to be known as Porker! Susie can�t be here today because she�s still too frightened of people approaching her and still too hand shy of anyone trying to pet her. So her brother, Ryan, and her sister, Bonnie, have agreed to parade in her stead. Drew and I didn�t want another dog�..we certainly didn�t NEED another dog. But sometimes things don�t quite work out the way we plan. I�m a firm believer that each and every one of our fur kids has come to us for a reason. To help them heal and learn the meaning of love; to help them understand that not everyone in the world is out to harm them. Susie was no exception. She was the lead story in the Spring 2009 newsletter. 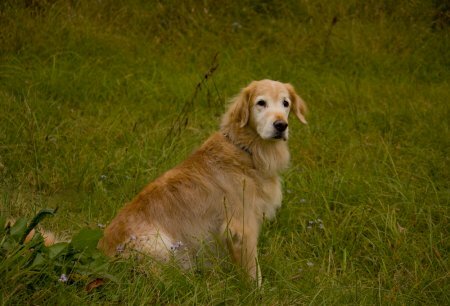 Susie was returned to rescue because of a foreign body obstruction in her intestine. Without her emergency surgery that evening, she would have died. She was also the victim of physical abuse so her ability to trust people is severely limited. 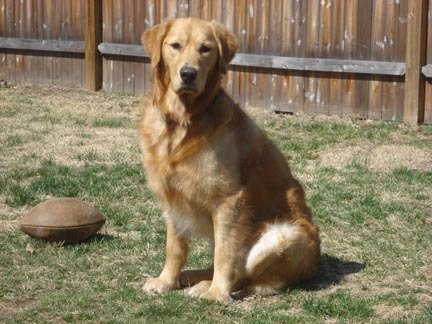 �The Q�, as she�s affectionately called, is a whirling dervish; a typical 2-year-old Golden with unlimited energy. She�s playful, affectionate and mischievous. She needs a 24-hour surveillance camera on her to prevent her from stealing whatever she can get her mouth on. Susie has a lot of baggage that we�re helping her unpack. We�re going to keep whittling away at all those negative emotions until that suitcase is empty. My new owners sometimes call me the �Jersey Devil� and I just don�t understand what that means?? I enjoy eating newspapers, magazines, toilet paper and I love open trash cans. I have full run of the house and I have noticed that all the aforementioned items are no longer within my jumping reach. I love playing with everybody and everything and when I�m not busy with that, then I�m either eating or I am holding on to somebody�s shirt or pants. I am really a great dog and my owners also think so but sometimes I�m just trying to be friendly by greeting someone new by hugging them or jumping. 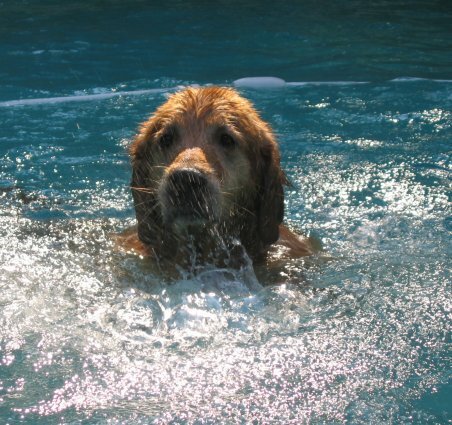 I have many opportunities to swim as we go boating every weekend, but I�m not overly fond of swimming yet. I do however, like to run in a huge enclosed area next to our house off leash with my owner. I also have been taught to go for fast walks while my owner is riding his bike!!! I require and get a lot of attention typical of my breed. Well, I hear a cell phone ringing and I have to try and grab it and then my owner will chase me around the house for awhile. When Oakee first came to me he was very depressed and withdrawn. After a couple of weeks he started to come out of it, in fact at Garden State Veterinary Specialists, it seems he made so many friends that when it was announced that he was in the waiting room (by mouth, not intercom) two interns came out to visit with him. He makes friends anywhere he goes. My Dad is learning to do what I want without too much fuss. He bought me a bed all to myself; he let me pick it out and I chose the biggest one. He's pretty good in the pet food store; I usually find a toy or two but he won't let me play with the cats that are on display in a cage � boy do they get nervous when I stop by to say hello. Dad caught me teasing the dogs on the other side of the fence because I was a little slow getting back to my spot on the patio. I couldn�t help myself � those dogs are so easy to tease; it's really fun. Hi, my name is Sadie. Actually it was Gretchen but my new family changed it to Sadie. I am soooo glad they did. I bet you did not know the meaning of Sadie is "Princess." When I came to my new home I was a little overweight and very tired. My mom put me on this great diet with lots of fun exercise. I've lost over 26 pounds!!! I feel great and I just can't stop smiling. I've been getting so much love and attention from my new mom and dad. Also every now and then my golden boyfriends come over to play. I can keep up with them and show them who the boss is! I especially love when Mom and Dad's kids come over and I get to shower them with hugs and kisses. This really is the best thing that ever happened to me. Thank-you to the Rescue and thanks to Mom and Dad for letting me be your "love bucket." My parents spoil me so much. We went to Ocean City all summer long and they even took me on their week vacation to Lake George, NY. I got to swim in the lake everyday and take lots of hikes. They say I am very calm for a young golden and I love to lick everyone all over. My parents also tell everyone that I will be wonderful with children and I can't wait to meet their little one that is coming this winter. My hips are doing great. My parents started to foster other dogs again and right now I have a foster sister that I love to wrestle with and chase around the yard. They say I�m finally acting my age! Maybe they will have to get me a brother or sister, hint, hint, hint. Hi, my name is Coby. 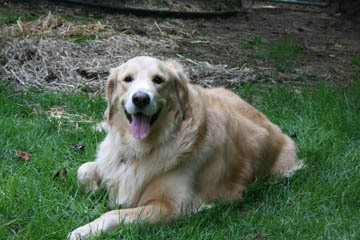 My brother Cody and I were surrendered to Golden Re-Triever Rescue in January of this year. We lived outside in a fenced-in pen for 5-1/2 years. We had an insulated shed to sleep in but not much else ... no toys, no dog beds, and no human companionship. After we escaped a couple of times the town threatened to fine our owners so they gave us to rescue. We had no trouble learning to live inside ... in fact, we loved it! We did get into trouble though ... there was so much to do. We ate our foster Dad's shoes, rummaged through his trash cans, and shredded whatever we could find. Rescue tried to re-home us together but they couldn't find someone who would take a pair who didn't already have any other dogs. You see, Cody doesn't like any other dogs except me because he got attacked by a dog when he was a puppy. Since I was "ready to go", they selected a new home for me that had another dog. So now I have a new brother named Clyde. We have a lot of fun together. And you know what? We have an in ground swimming pool and we live near the beach. Boy do I love to swim. I'm really good at diving for seashells that Mom and Dad throw in the water and you should see me ride the waves! Mom and Dad tell me I'm a great snuggler and they love the little grunting noises that I make. We're a really happy family now and I feel like I've lived here forever. Life is wonderful! I think I am finally home. I have been shuffled around a bit in my short 12 weeks. My name is Brady. But I keep hearing my new mom says she wants to call me Gromit for some British cartoon dog. Or Quinn for some football player. I thought she worked for a hockey team? I start puppy kindergarten on Monday. Mom says I will like it. Aside from that my new big sister, Trinity, is a bit bossy. She does not like it when I try to climb over her. She growls and pushes me over. She was good to have around at the lake at Goldstock. She chased another big dog away from me when that dog scared me. My cousin Loochie is my BFF. He is a rescue too. I hear he is eight but he always wants to chase me and tackle me. Nonstop fun! He taught me how to select the best figs from the tree in the backyard. Mom admonishes us for that. I think she wants them for herself. My new dad is simply awesome. He takes me to the park all by myself! Likes to cuddle and gives me special healthy treats in my lunch! Takes lots of pictures of me. Always wants to play. I love him best! I am glad to finally be home and safe. Loochie says he got adopted at Thanksgiving but he thinks anytime one of us gets adopted it is Thanksgiving. It took a long time but it was worth it even if I get a new strange name. Now where is that turkey Loochie mentioned?